I’m so blessed to be married to a remarkably thoughtful and romantic man. He’s especially good at expressing himself with words. Discovering hidden notes is something that I’ve become very accustomed to over the years. Not long ago, I was looking for a new Bible and Josh helped me pick out one that was just perfect for my needs. Shortly after acquiring it, I found this sweet note stuck inside (in Song of Solomon…how appropriate). It may not be as elaborate and beautiful as some of the many cards he’s made for me over the years, but this note means so much to me. 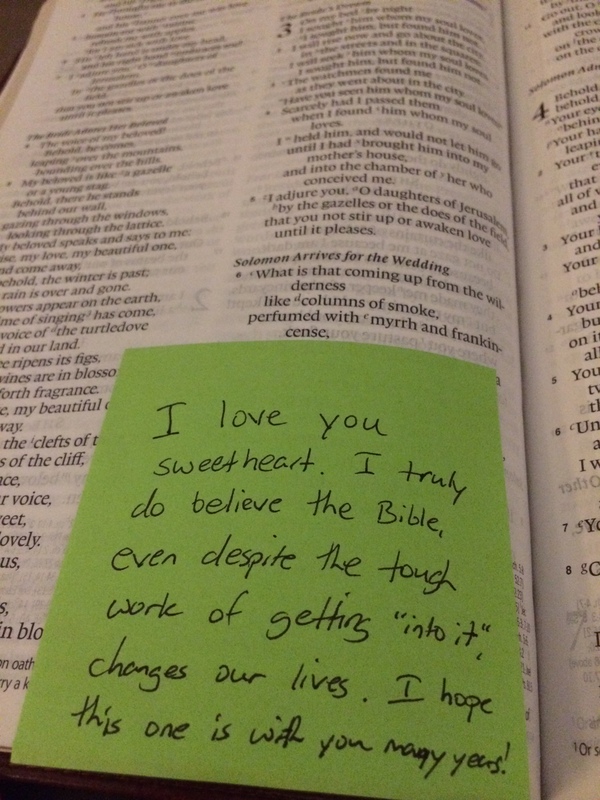 I’ve kept it right where he put it and every time I grab my Bible and see that little green slip of paper tucked in there, I am reminded not only of my husband’s love but of God’s amazing love for me, as well, that is exemplified in my husband and the way he cares for me.